On our way back to Burbank to catch our flight to Oakland, our hosts for the weekend drove us to Silver Rock for a meal at "The Coffee Table". This was by no means a fancy place, but judging by the queue at the counter, which snaked past the window and out through the front door, it was certainly a popular place to meet friends and linger over a classic American brunch. You can't reserve a table until after you've ordered your food, and we had our eye on a large table outside, under the covered terrace, that would comfortably sit the five of us and allow the smokers in the group to partake of their favourite habit without having to leave their seats. Despite the dozen or so people ahead of us in line, the table was, luckily, still available once we had placed our order. We took our beverages outside and enjoyed the 100+ degree temperatures whilst we waited for our meal. 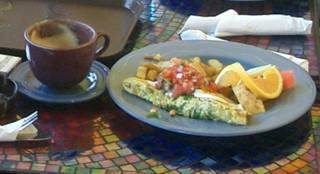 I chose a "South of the Border" Omelette which listed green chili, cilantro, avocado and cheese with sour cream and salsa as it's ingredients. I could have had the same dish as a scramble but preferred to try it in its more defined form on this occasion. 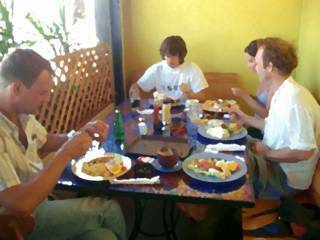 When the large plateful of food arrived, everything looked vibrant and fresh. There were some large slices of three different varieties of melon and a slice of orange adding a sweet aside to the otherwise savoury dish. A pile of fairly good but not-quite-crispy-enough breakfast potatoes nestled next to the omelette which was topped with an ample helping of the promised salsa and cream. The omelette was good and I was happy that the inclusion of chili, raw onion and cilantro gave it the spicy kick I was longing for. On another visit I would request it without the cheese. (Being a European I am not a huge fan of the flavourless, bright orange, 'plastic' American cheese that is more often than not used in these kinds of breakfast places. This omelette didn't even need cheese, it would have been perfect without.) Overall I was impressed that the dish tasted really fresh and had no excessive oil or grease on either the egg portion or the potatoes. Although I didn't get to try anyone else's' dishes, the burgers, scramble and banana pancakes all looked good too. Cost for 5 people including a drink each: $55. Thanks for the internet service, so we can drink coffee and work at the same time. One probable reason the table out front was empty is that the Coffe Table also includes a back patio that is non-smoking. So nice for someone who's there to eat and not smoke to also be able to enjoy the sun, fresh air, and the little sparrows that will help you if you can't finish your food. Plus it's away from the street so traffic noise is reduced to a lull. What an amazing table!! Check out this one too for coffee tables.